The music is largely 20th to 21st century (if you count the date of the transcriptions) but the sound and mood of the album ranges from the romanticism of Mendelssohn and Tchaikovsky, the post-romantic Mahler, to the neo-classicism of Prokofiev and a dash of modernism from Messiaen, Gandolfi, Andres, and Auerbach. No words, no politics, just some really beautiful music. There are 14 tracks of which the Mendelssohn and the Mahler will be the most familiar to listeners. What is interesting here is a certain unity in these seemingly disparate works which range over nearly 200 years of compositional invention. In fact this recital program strongly resembles in spirit the justly popular programs of Jascha Heifetz and his acolytes. That is to say that this is at heart a romantic recital program sure to please any aficionado of the violin and piano genre. Two of the tracks, those by Michael Gandolfi and Lera Auerbach are for solo violin. The unaccompanied violin repertoire best represented by J.S. Bach’s Sonatas and Partitas is a relatively small one and one fraught with difficulties for composers as well as performers. Fear not though, these pieces are well wrought and represent significant contributions to the solo violin literature. The Gandolfi (1956- ) Arioso doloroso/Ecstatico (2016) was commissioned by Mr. Kutik and this is the world premiere recording. The composer utilizes a basically romantic sounding style with clear references to Bach at moments to create a very satisfying piece imbued with depth but eminently listenable. Gandolfi’s eclectic oeuvre is by itself worthy of further exploration. Lera Auerbach’s (1973- ) T’Filah (2015) is a reverent (though not excessively somber) prayer written in memory of the victims of the Nazi holocaust. Auerbach shares some Russian roots with the soloist and this brief composition will leave most listeners wanting to hear more from this fine and prolific composer. Timo Andrés (1985- ) plays the piano on the eponymous track Words fail (2015), the second of the two works commissioned by Kutik and premiered on this disc. He is a skilled composer using a wide variety of compositional and instrumental techniques (which he mentions in his liner notes) to create a sort of modern song without words that fits so well in this program. Andrés is certainly among the rising stars both as composer and performer. 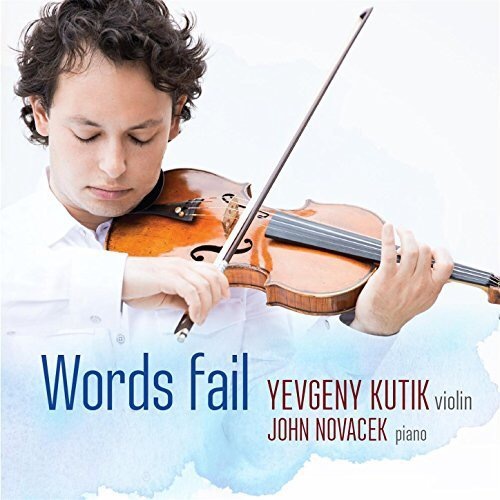 One should definitely pay attention to the fine work of Kutik’s accompanist John Novacek whose precision and interpretive skill so well compliment the soloist. The art of the accompanist shines very clearly here. Overall a great recital disc from a soloist from whom we will doubtless continue to hear great things.